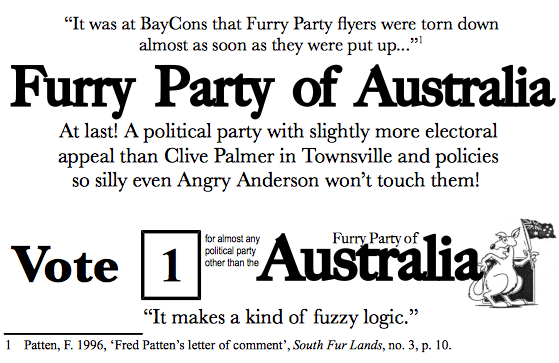 I have a tradition of doing a Furry Party of Australia flyer for every federal election. I haven't had a lot of inspiration this election but I didn't want to break the tradition. It won't really mean anything unless you keep up with Australian politics. No, that runs the risk of increasing its popularity and then the first electoral promise about popularity would be broken. Do they still exist? Do they still contest elections?